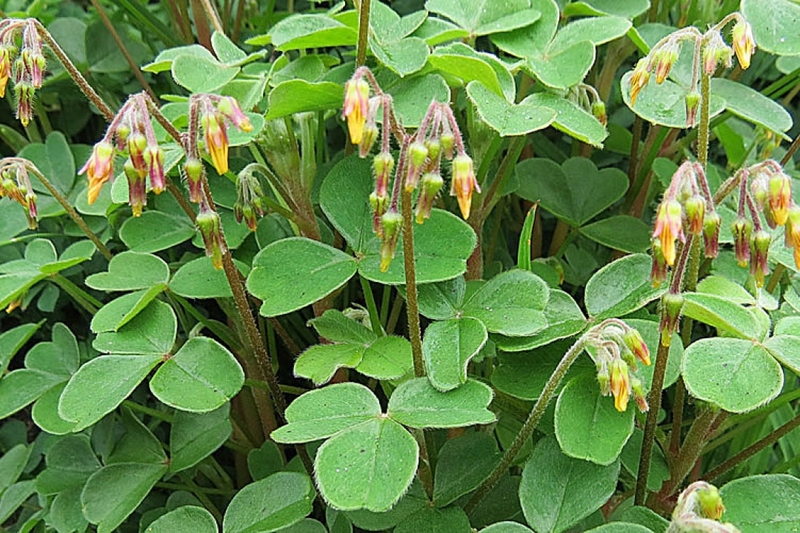 Oca (Oxalis tuberosa): growing, planting, caring. Sick of fighting mildew? Try Oxalis tuberosa! Traditionally grown in South America, Oxalis tuberosa was introduced in Britain around 1829, where it almost replaced the potato during the great famine in Ireland and the potato crops were destroyed because the plant was attacked by mildew. It has since been forgotten, but nowadays hobby gardeners are getting interested : it is easy to cultivate, and its small yellow tubers the size of pigeon egg are worth trying out! It is a perennial plant, but cultivated as an annual in temperate climates, with succulent stems and trifoliolate fleshy leaves of a brilliant green and small, golden yellow flowers. Oxalis tuberosa requires a rather sunny exposure and a relatively rich soil. Note that in its native Andes, it is grown from mid to high elevations, where temperature ranges from near freezing to nearly 80° F - 27°C - during the growing season. Humidity is generally high, although there may be long periods of drought. You can plant directly in the open soil after the last frosts, or you can start in trays or pots indoor, before planting later on in the season - knowing that approximately 200 days will be needed between planting and harvesting . Plant them in rows, about 70 cm apart and keeping 35 cm between each plant. Oca does not have large water requirements - it is nonetheless sensitive to drought. Water during the summer period but without excess, once a week if it is very dry, if possible in the morning. Water every 6 days during the first weeks following planting. To hill or not to hill? Many growers and sources recommend hilling oca as it grows, much as you would for potatoes. While this may be a useful strategy for propagating the plant, it is not ideal for producing tubers of good eating size : when you hill up the plants, you cause the formation of additional tubers, diverting energy into them where previously all of the energy was sent into the first tubers. 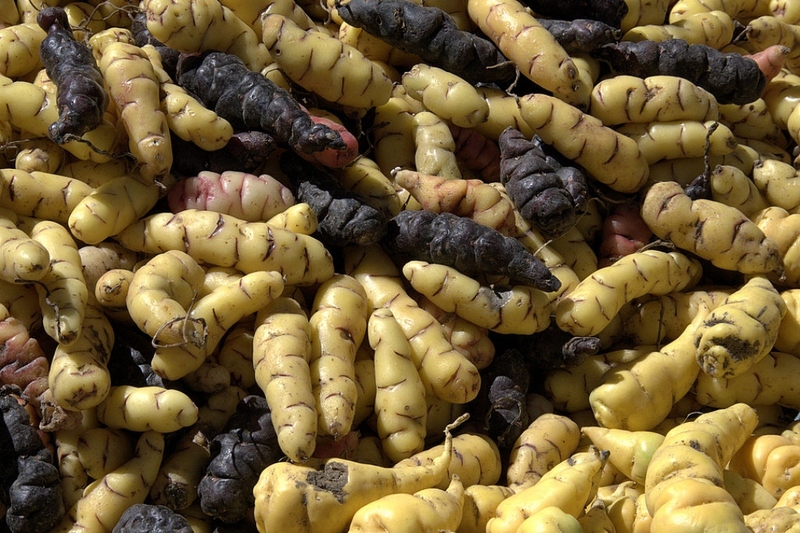 In addition, you are burying parts of the plant that are photosynthesizing at a time of the year when oca needs to form tubers as fast as possible before the frost - so, you are reducing the amount of energy received by the plant and dividing that reduced amount of energy into a larger number of tubers. Our advice : it depends on your location of course, you might consider hilling if you're confident your plants will receive as much light as they need. We at Groww add a good layer of mulch to our crops, and let them be - but then, we live in Northern France. When the days get shorter and the stalks fade and bend, the tubers will begin to form. If frosts are feared, protect the plants with a veil or with a thick layer mulch. In most temperate climates, you should not plan to harvest ocas any sooner than the first week of November. Some say best yield results are achieved two weeks or more after the plants have been killed by frost : the tubers continue to draw down nutrients from the dying plant for a last burst of growth. Let the tubers dry for a good week, then store them like you store potatoes : relatively low temperature and high humidity will produce the longest and highest quality storage.